Piedmont Chapel is a pretty new church, formed in 2014. Their first meeting attracted 36 and three years into their journey they have helped over 550 people find new life in Christ! They have really strong social media presence and a great website. Let’s see what we can learn about what they do online. When you first visit their church website you will quickly notice their primary color which is consistently used in all of their materials both in print and online. It highly enhances their presentation and distinguishes them online. It creates a feeling of trust and once it is built online, new visitors will remember the feeling when they visit in person. There is a lot going on when you visit the homepage but Piedmont Chapel’s church website does really well to clearly communicate different aspects of church life right on the homepage. The “above the fold” section has a friendly and welcoming video with clear call-to-action buttons. The buttons make a nice distinction between the online action (Watch online) and offline (Plan a visit). Both of them have a clear goal of introducing a visitor to the church by taking part in the service. Most of the pages that explain the beliefs of a congregation are usually filled with tons of texts. It doesn’t help in the discovery process. Piedmont Chapel uses a clean structure with clear headings and visuals. For a page that is usually monotonous, they made a feel of importance in the way they explain their beliefs. One of the key elements of any church website are photos. They create a connection between the user and the people in the church. 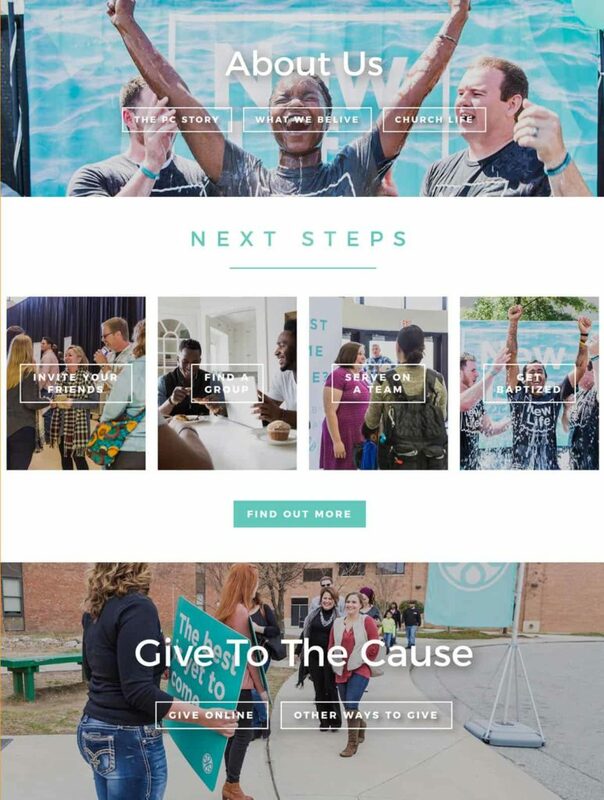 The photos on Piedmont Chapel’s church website have a great quality but also they focus on real people who are a part of the church. They did a fantastic job in how they selected the photos for their church website but also for their social media accounts. This is an element that is also related to a church website since it has a great potential of driving traffic. And again, people are the highlight! Great and consistent content helps you connect with the church.